Aikido a martial art that eliminated several jujutsu techniques and focused on specific throws and atemi. Like Us on Facebook to learn more about classes, styles and people in Shorin-Ryu Karate & Kobudo in Arizona as well as in the world. A martial art that was created in the 20th century gained worldwide popularity is Aikido. Aikido (合気道) (the way of harmony) is a grappling art similar to jujutsu and was the creation of Morihei Ueshiba (1883-1969) in Tokyo during the 20th century. 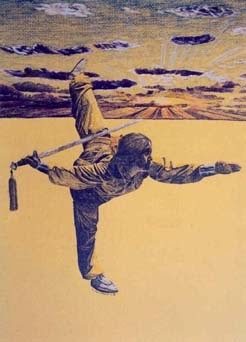 According to Farkas and Corcoran (1983) this art was created in 1942; however, like any art, it is difficult to say exactly when it was created as martial arts are created over extended periods and continue to evolve through time. Frederic (1998) suggests aikido began its evolution in 1931 and its major governing association dates at 1948. 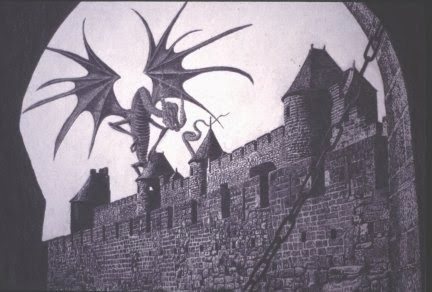 So this art likely was envisioned and continued to develop in the 1930s to 1940s. The name ‘aikido’ was officially registered with the Japanese Ministry of Education in 1942, thus it is taken to be the birth date of this art. The creator of aikido, Ueshiba was described as a deeply religious man. He was also nationalistic and created his art with religious and nationalistic overtones. 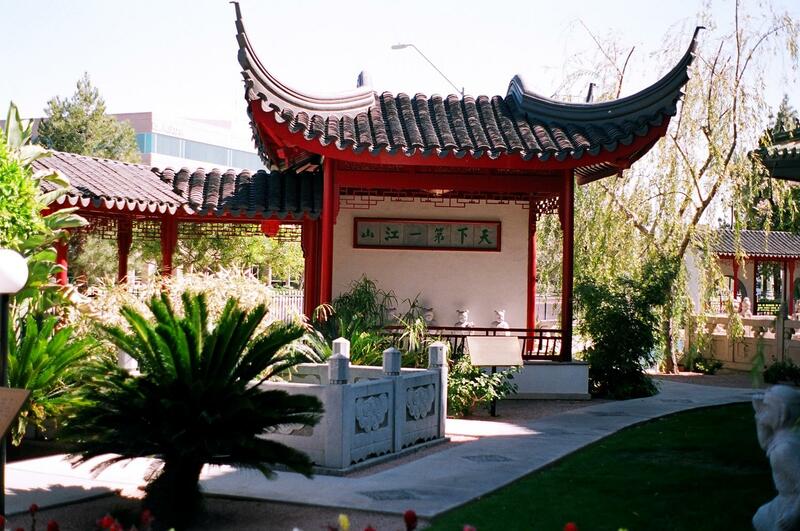 Ueshiba avoided including any connection to kempo (Chinese hand) and other Chinese arts (Frederic, 1998) as he wanted this to be an exclusively Japanese art. At that time in history, nationalism in Japan was rampant. Ueshiba linked aikido to Zen and Shinto, the national faiths of Japan (Farkas and Corcoran, 1983). He emphasized harmony between breath or spirit (ki), and body (tai) combined with nature while emphasizing harmony between the mind (shin) and moral outlook (ri). In Zen, followers believe that the center for meditation and power is the tanden, a point situated 1.5 inches above the navel. This point is emphasized as the source of power in aikido and is the point from which ki (spirit) is thought to originate. Anyone who studies meditation and yoga is introduced to this concept early on. So, is aikido a religion? No, it has some philosophy associated with technique as do all traditional martial arts. And this is one of the major differences between traditional martial arts and sport martial art. Remember the Karate Kid? In the movie, traditional martial arts were represented by the philosophy-driven Mr. Miyagi, while sport martial arts were represented by the Cobra Kai thugs and their lack of positive philosophy. Ueshiba started his training in jujutsu. And his aikido was modified from jujutsu emphasizing the philosophical aspect of martial art known as ‘do’. Do meaning the way or path to enlightenment. Many techniques (waza) in jujutsu and judo require close contact defense and grappling, whereas Ueshiba avoided these techniques in favor of placing an attacker at a distance. He began his practice in Daito-Ryu Aiki JuJitsu and through time, named his new art Aikido. Today, more than 30 different sects of aikido exist. Ueshiba’s philosophy was to defend against an attack without causing great injury. Aikido attempts to redirect an attack by blending with the attacker’s movement and redirecting the attack by using the attacker’s momentum against himself. This is done with entering and turning movements. 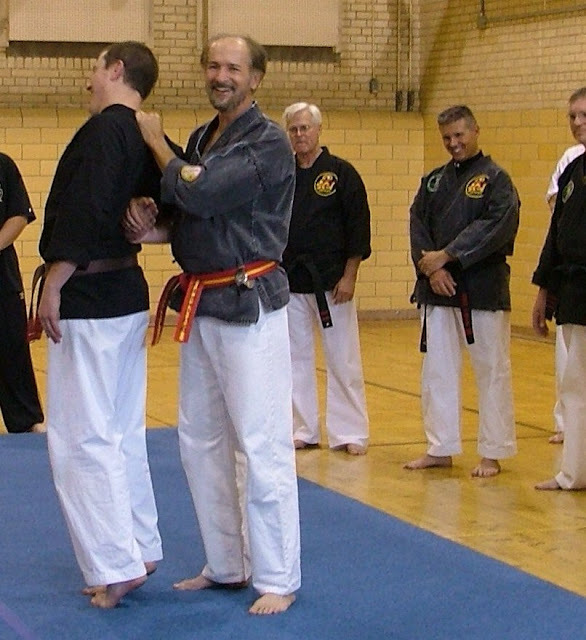 Aikido uses many joint locks to manipulate an attacker while attempting to assist the aggressor in moving in the same direction as the force generated by an attack. Joint locks are usually followed by a throw as the attacker is manipulated. Because of joint locks, any parent considering signing their children up for aikido classes, need to be aware as to what restraints might do to their kids wrists, elbows, etc, as growth plate injuries do occur. Aikido attempts to lead an attacker into a circular path so that the defender (tori) turns on an axis. The circular motion allows the defender to neutralize an aggressive action by gaining control of momentum (Westbrook and Ratti, 1970). 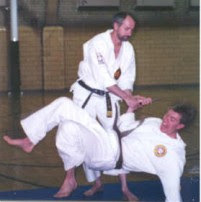 Armbar restraint applied by Grandmaster Hausel to Brett Philbrook (2nd dan) of the Laramie Police Department at a clinic at the University of Wyoming. Like jujutsu, this art works off of atemi. Atemi is a vital point strike used to disrupt the attacker’s balance and focus. Following atemi, the defender will use evasive moments and body shifting (tai sabaki) to manipulate the attacker’s force so it can be used against himself as the attacker is redirected and thrown, have his feet swept out from under himself, or a joint lock applied for control. Many of the techniques in Aikido end with grappling to subdue the opponent. University of Wyoming in Laramie. Most techniques in aikido are used to control (katame waza) or throw (nage waza). According to some sources, there are over 700 techniques that fall under these two categories that are derived from the basic kata (forms) of aikido. Aikido kata consist of freeing oneself from basic grips or grabs (te hodoki), throwing, and immobilizing with use of pressure point attacks (kyusho) on joints (kamsetsu gaeshi). Aikido also has a limited number of weapons as part of its training including the bo (6-foot staff), jo (4-foot staff) and yawara (short stick) (Frederic, 1998). 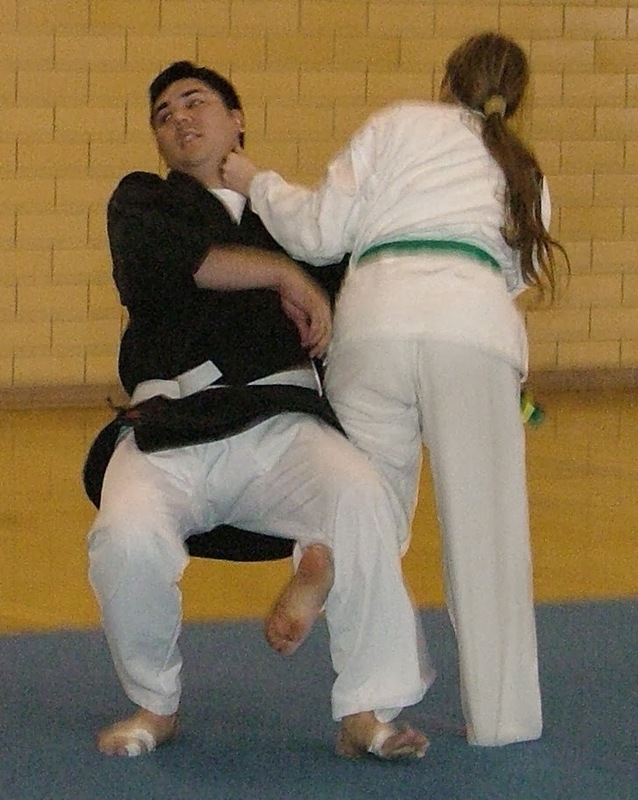 An example of an aikido technique will require the opponent (uke) to throw a punch. The defender (tori) will block or evade the punch followed by atemi to upset the uke’s balance. This is followed by seizing the wrist and twisting the wrist joint to activate pressure points or nerve centers to bring the attacker to his knees. According to Mitchell (1998) aikido has generally lost much of its effectiveness through time. Genuine attacks were replaced by compliant attackers. For example, a would-be attacker typically runs forward with arm held out until the defender employs a defense. This is followed by a symbolic strike or atemi. However, without a focused and powerful atemi, one learns to defend improperly. 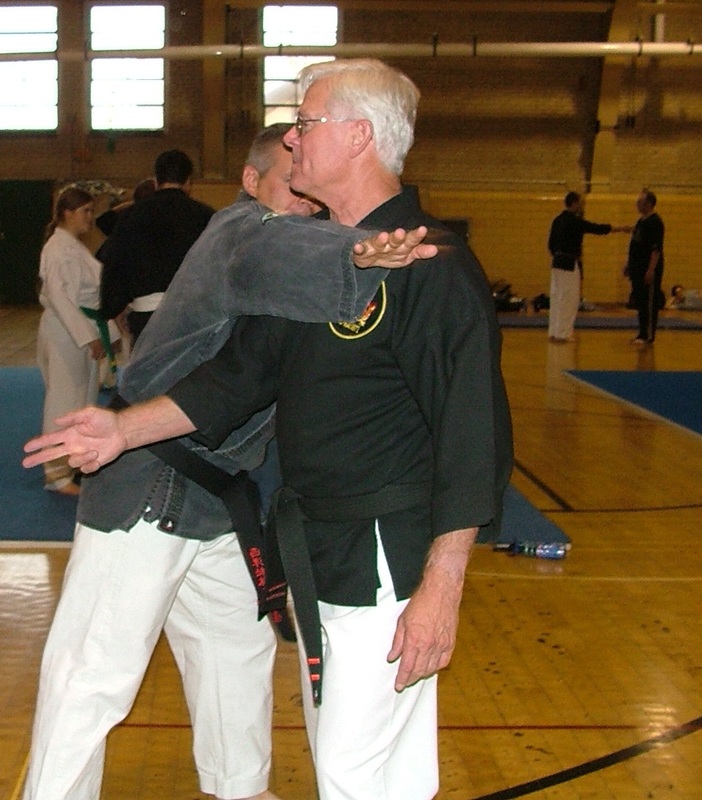 As a result, some aikido masters separated from the mainstream aikido association and attempted to develop more effective methods to practice self-defense. One school, Tomiki aikido, incorporated contests in the art to try to improve reflexes, but this is something that was already part of the jujutsu and judo arts, where continuous defenses (randori) are performed one after another non-stop. Another school, Yoshinkan aikido, focused on the importance of ki requiring their uke to attack with energy and force. As a result, Yoshinkan aikido has been used to train many Japanese law enforcement agents as it is thought that this emphasizes more realistic atemi. The atemi (or strike) in aikido is very important. If not practiced with focus and power, the practitioner will learn an incorrect response to an attack. An atemi can include shuto (open hand) strikes to the arm, teisho (palm strikes) to the chin, kozumi geri (crescent kick) to the chest, etc. 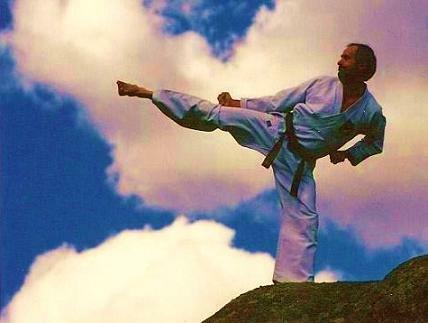 Two of my black belts in the 1990s decided to test atemi to see if it actually worked. Scott and Jason were in excellent physical condition and they told me about their experiment after the fact. Scott held onto Jason’s left wrist with both hands as Jason applied a teisho uchi (palm strike) atemi to the side of Scott’s chin with focus. Scott said his grip dramatically lessened and he stood vulnerable to Jason for the next several seconds. He indicated Jason could have done anything he wanted to. Then Jason grabbed Scott. Scott struck Jason with atemi. Jason indicated that it took him 30 minutes before he knew what was going on (he had essentially been knocked out on his feet). Do NOT attempt to do this same experiment as this produces a concussion and can be dangerous and there is no need to duplicate these results since it has already been verified to work by Scott and Jason. The traditional aikido dojo (place of the way) is simple. Floors are matted since practice involves throws and unlike judo and jujutsu, the aikidoka (practitioner) does not slap the mat (tatomi) when thrown, but rolls out of the fall (ukemi) similar to ninjutsu practitioners. To practice these types of break falls, aikidoka dive onto the floor extending one slightly curved arm forward while curving the spine to keep the head tucked in. As a student progresses, these dives become higher and higher and cover greater distances. In some schools, students are encouraged to jump high over the backs of others, something we do not encourage in karate simply because karateka do not practice throws and falls constantly during training. Heather From applies yubi waza (thumb throw). Aikido, like most Japanese martial arts, has a ranking system of colored belts (kyu) that vary from school to school. As one progresses, they may reach the upper levels of aikido or dan (black belt) ranks. Aikido practitioners typically wear a hakama (split skirt) with a gi jacket. Exercises in aikido serve to loosen wrists and joints. During training, the wrists are seized and twisted and joint locks applied until the uke either slaps himself on the thigh as a sign that the tori should stop applying pressure, or until uke yells ma te (stop). Through time, the wrists become supple. The more one practices, the less the wrist hurts. However, in the beginning, one can expect sensitive and swollen wrists. 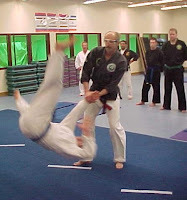 Because aikido does not involve intense striking and kicking techniques such as karate, the public views this art as being less violent and is therefore a good art for many law enforcement agents. It also focuses on restraints, another important law enforcement application. Arizona School of Traditional Karate in Mesa, Arizona. Judo - the soft art?